The wolves make peace with the sheep after a thousand years-long war. Peace is useful for both. Yes, the wolves had swallowed many confused sheep, but the shepherds had sewn many coats out of the wolves’ fur. It was difficult to prey as it was to graze. It was impossible to benefit from what you owned. As we said, they make peace and exchange the prisoners. The wolves pick up their babies; the sheep, their dogs. Confident that the promises will be kept, dogs are torn down in their sleep, none of them can survive. The tale says that the sheep and the wolf do not make friends. This should be our lesson: The oppressor and the oppressed, the people and their enemies can never be friends, that is what we say. The peace negotiations and the peace agreements can never lead to a real peace… The agreements between the opposite classes that have antagonistic contradictions against each other can never benefit any of the sides. Therefore, if there is an agreement, it is an agreement of imposing the will of the powerful party upon the weaker one. The peace between the wolves and the sheep will end as soon as the sheep become unwary. This is how the “peace” negotiations between the Colombian State, the fascist collaborator of the US Imperialism and the FARC take place. The Colombian State murders the FARC guerrillas if it has the chance. The “peace” negotiations, however, continue between the Revolutionary Armed Forces of Colombia (FARC) and the fascist Colombian State in the Havana city of Cuba. Weeks ago, Colombian army murdered one of the top commanders of FARC, Alfredo Alarcon Machado in a military operation. A member of the Central Military Council, “Roman Ruiz” Machado was commanding the northwest block of FARC. Colombian State had set a 500.000 dollars price to seize Roman Ruiz. It is said that 5 more FARC members were also killed with him. FARC declared a unilateral ceasefire. The negotiations followed. The President of the fascist Colombian State Juan Manuel Santos had already declared that the military operations against FARC would not stop as the negotiations went on… And Colombian State did not stop killing the FARC guerrillas since the beginning of the negotiations. Apart from the guerrilla commander Alfredo Alarcon Machado, FARC has lost 34 more guerrillas recently. After the operation when 8 more FARC guerrillas have been killed, Colombian President Juan Manuel Santos permitted the attacks against FARC despite the peace negotiations which led the killing of dozens of more guerrillas. Recently, 34 guerrillas have lost their lives in the army bombardments. After the killing of 26 guerrillas in Cauca and 8 in Antioquia, FARC made a statement and declared that they were forced to end the unilateral ceasefire that they have been observing for 6 months. As mentioned in the FARC statement, it is an obligation to end the ceasefire. This statement is the evidence of the fact that there can be no peace with the fascist Colombian State. The peace negotiations that the FARC and Colombian Government declared to be launched on 8th of October in the capital city of Norway, Oslo are not the first. In this 48 years-long war, many negotiations took place between FARC and Colombian State. There have been occasional ceasefires during which the Colombian army continued to massacre the guerrillas. In 1982 newly elected President Belisario Betancourt made a call for negotiations to FARC and other organizations that were waging an armed struggle. FARC replied this call. After months of reconciliation negotiations, FARC and the government undersigned the La Uribe Agreement. According to it, the agreement and the ceasefire would begin in 1984 and continue until 1990. This agreement gave birth to the Patriotic Union which included the guerrilla groups, unions, human rights organizations. Colombian Government, however, violated the agreement. The first negotiation took place at the beginning of 1984. FARC declared ceasefire at the end of the negotiations. FARC launched its armed struggle once again after the army violated the agreement. Nothing came out from the negotiations that took place during the Presidency of Cesar Gaviria between 1990-1994. Cesar Gaviria attacked against the FARC headquarters in Casa Verde during the negotiations in 1990. In 1999, Pastrana government accepted the implementation of unarmed regions in five provinces that was proposed by FARC. At that period FARC attempted to build its own organizations in the political, administrative, legal and educational fields and to train and strengthen its army for the future. The negotiation process that was launched once again in 1999 fell apart at the beginning of 2002, when the Colombian President Andres Pastarana launched a military offensive. Financially and militarily backed by the US, the new President Alvaro Uribe launched massacres against FARC and the people in 2002. The ceasefire broke down in February 2002, when FARC hijacked a plane to kidnap a member of parliament. FARC gave huge losses on the level of guerrilla forces and commanders/leaders between 2002 and 2008. FARC commander Ricardo Palmera was imprisoned in May 2004. A leading cadre of FARC, Ricardo Palmera was murdered in a cross-border bombardment on May 1st, 2008. Special Forces of Colombian Army inflicted great losses on FARC during a military operation in 2008. Colombian Army took back Betancourt and 14 hostages who had been captured by FARC for 6 years. Jorge Briceno, a military commander of FARC nicknamed as Mono Jojoy was murdered by the fascist Colombian Army in 2010. FARC leader Alfonso Cano was murdered on November 4th 2011, after the attacks by the Colombian Army in Suarez and Loperz de Mikay regions. 20 FARC guerrillas have been killed after a military operation against the FARC camp while the negotiations between the government and FARC was going on in Oslo, Norway on December 4th, 2012. 39 FARC guerrillas have been massacred during the attacks by Colombian State between 19 and 21st January 2014. Alfredo Alarcon Machado, nicknamed Roman Ruis has been killed in May 2015. 33 years-long negotiations between the Colombian State, the lackey of US and FARC guerrillas brought nothing but massacre and poverty. Today, there are the “peace” negotiations on the one hand, and the massacres on the other. FARC’s statement about ending the ceasefire would not mean anything unless the organization makes a thorough self-criticism and decides to fight with the perspective of making a revolution rather than reconciling with the Colombian State. FARC does not need to go far to see the consequences of making agreements with imperialism and its collaborators. It would be enough if the organization looks at what happened to other armed organizations as a result of “peace policies”. Nothing has been won for the people through reconciliation with imperialism and collaborator powers. On the contrary, a new world that has been the hope of the people was lost. They have agreed on sending a couple of members to the parliament, the price of it being hundreds of thousands of lives lost. FARC cannot say “We are different, we will not be like that”. What happened so far is what will be in the future. You do not need to be an oracle to tell what the FARC will meet. Colombian State is saying that they will not halt the operations. They are saying that they are going to continue murdering. Bourgeoisie has a very strong class hatred: It does not forget! A farmer and a snake became friends and started to live in the same house. One day, the child of the farmer cut the tail of the snake with a knife when he was playing. And the snake bit the child and killed him. When the farmer saw the snake years later he said “past is the past, let’s be friends again”. The snake replied, “I have this pain in my tail and you have this grief because of your child, we can never be friends”. This is the contradiction between the bourgeoisie and the people. They can never be friends. And bourgeoisie knows from its hundred years of experience that even the smallest compromise given to the revolutionaries who struggle to destroy them and to liberate the oppressed people might end up with its own destruction. That is why the parasite bourgeoisie hates the working people and their vanguards. If we do not feel the same hatred, we end up being the feed at the table of the wolves. Good intentions do not work in politics and peace cannot be won with good intentions. Peace is won through war. The organizations in El Salvador, Guatemala and Mexico that wage a guerrilla struggle got weaker ideologically after the collapse of the Soviet Union and the counter-revolutions in the Balkans in the 1990s. They lost the perspective of seizing the political power, the hope of liberation and they were liquidated. The results of the peace and agreements between the oligarchies and the guerrilla forces in those countries were a total disaster. The fates of the revolutionary organizations in Latin America that attempted to reconcile with oligarchies and imperialism taught us valuable lessons. There can never be peace between the wolves and the sheep, imperialism, collaborator powers and the oppressed people. Making “peace” with imperialism and its collaborators would mean submitting to their will. Peace is the liquidation of the armed liberation struggle of the peoples. The liberation of the people lies in revolution not in reconciliation. Revolutions are made with guns and protected with guns. There is no other solution than growing the war for revolution and to fight to bring a real peace. 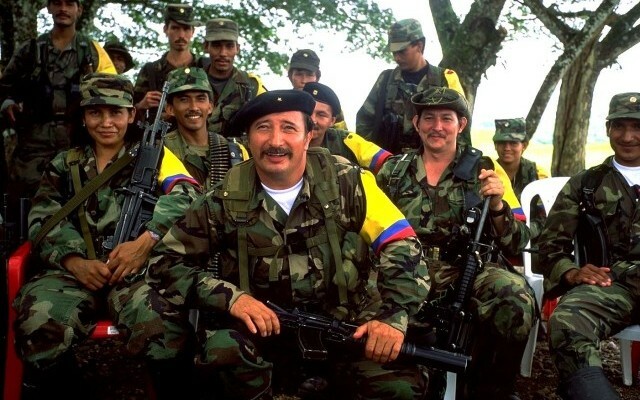 FARC is fighting against the Colombian State for 53 years. This war has cost 4.5 million exiles, 600.000 deaths, 60.000 disappeared and 8.000 militants in prisons. Fascist Colombian State is responsible from all these losses. And there can never be peace unless the Colombian State is defeated decisively.